Hikers don't always stay on the trail, and when they don't it can lead to some cool discoveries. Hiking and backpacking isn't just about getting out to enjoy nature. It also fills our need to explore and discover new things, something that seems hardwired into us since the beginning of time. Over the years hikers have discovered some really amazing things while backpacking through different parts of the world, from mummified remains to long lost treasures. Here are eight of the most memorable. In August of 2014, a hiker trekking across part of the desert in Moab, Utah stumbled upon hundreds of preserved dinosaur tracks. Researchers studying the prints have discovered over 200 tracks from a dozen different dinosaurs, including a long slash made in the mud from an ancient crocodile. After some dating they found the tracks dated back to 125 million years ago. The area has since been cleaned up and is now open to the public for everyone to enjoy the discovery. The French Alps has claimed more than its fair share of planes over the years. Two of these plane crashes, one from 1950 and the other in 1966, have been leaving clues as to where they potentially rested for years. Old newspapers from 1966 and a mail bag full of letters dated 1950 have already surfaced from the crashes, but the most expensive find came in September 2013 by a French climber. 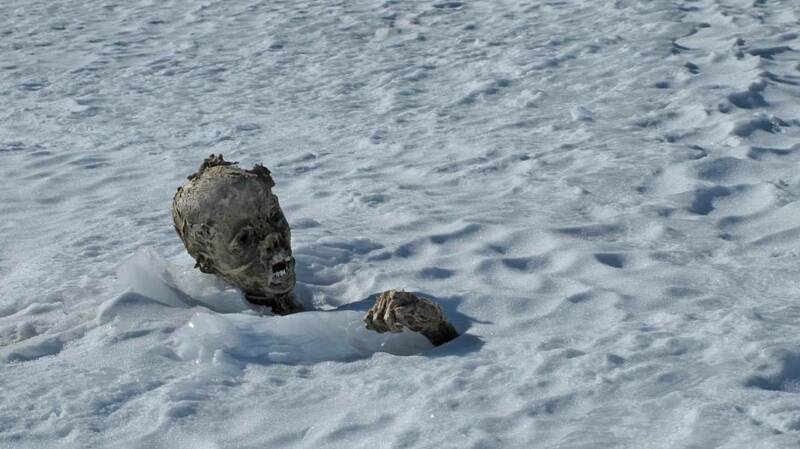 While climbing and hiking Mont Blanc, an unnamed person noticed something buried in the snow. Upon investigation he uncovered a metal box containing emeralds, rubies, and sapphires. In total an estimated value of $332,000 of jewels were inside the box. Authorities still aren't sure which of the two flights they are from, but are trying to track down any of the owners or heirs to them. In 1959 seven hikers set out on the slopes of Pico de Orizaba, which is the highest mountains in Mexico. Unfortunately, only four of them ever returned from the trip after a large avalanche broke them up. It sparked a huge mystery among the locals as to what happened to them, and we may now know. Earlier this year a team of climbers set out on the same trail those seven went down. 1,000 feet from the summit they came across something sticking out of the snow. As they got closer they realized it was a pair of mummified bodies with remnants of clothing and hair still attached to them. Removing the bodies proved difficult, as the tightly packed snow and ice surrounding them for the last half century acted as cement. One of the surviving hikers from the trip has positively identified the corpses, but they are awaiting DNA testing to be 100% sure. Searches are still underway for the third body, which has yet to be found. One of the greatest unsolved mysteries in South America was the disappearance of flight Douglas DC-3 in Chile. When it vanished on April 3, 1961 on its return flight to Santiago, it took with it the lives of 24 people, including eight professional soccer players. Rescuers spent weeks searching for the plane to no avail. Symbolic funerals and prayer groups drew huge crowds of people together in hopes of finding the passengers. Last February, a group hiking the Andes nearly 54 years later think they have found the plane. At 10,500 feet and about 215 miles from Santiago, they stumbled upon the fuselage of a plane. According to the hikers, there were bones and debris scattered around the area of the wreckage. Authorities are still investigating the remains to verify if it is the missing plane. In the summer of 2014 a team of archaeologists found 400 Stone Age artifacts from areas where glaciers have melted in Norway. It hasn't just been limited to that one spot, either. Glaciers melting the world over are giving way to amazing things being found more regularly than ever. So far hikers have found mummified remains, 1,700 year old tunics, Viking weapons, horse skeletons, arrows from the Stone Age, bows, spears, and much more. These finds are incredibly important to the science world when it comes to understanding past civilizations and their travel patterns. Scientist believe we will only have 50 years or so to be able to keep finding these rare artifacts before they are lost again. They are asking all hikers and climbers in glacial areas to keep a look out while on excursions. Helmut and Erica Simaon were two vacationing German hikers trekking the Otzal Alps in September 1991. When Helmut got a little ahead of his wife, he stopped for her to catch up. While waiting he noticed what looked like trash left on the trail from previous hikers. Upon closer investigation he found the remains of someone face down in the snow. They made their way to a local lodge and contacted authorities to retrieve the body. Three weeks before, two more mummified bodies of missing hikers from 1934 had been discovered. The authorities assumed they were dealing with the same instance since the glaciers in the area were melting. They used a large stick to try to break him from the ice. When that failed they grabbed him by his clothing to pull him free, but just shredded the material. To get him free they finally brought in a ice pick and jackhammer to break the ice around him, accidentally poking holes and breaking some of the body's bones. After finally breaking the body free, they put it in a coffin and had it shipped to be identified. Italian and Austrian authorities were shocked to find that the remains were actually that of a caveman from 3,000 B.C. One of the oldest and most preserved mummies ever found was almost destroyed by carelessness along with some of the items frozen with him. 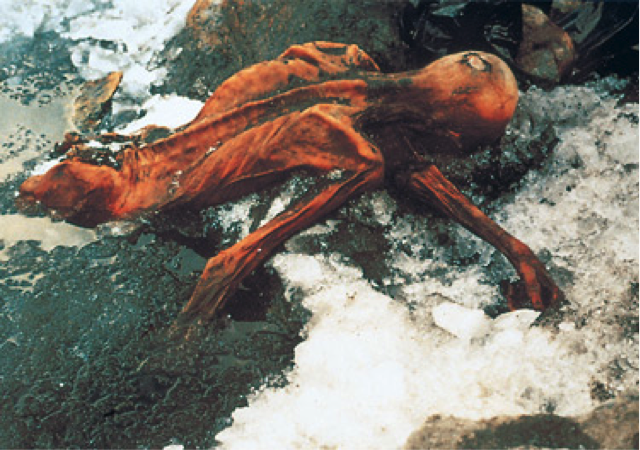 The mummy became known as Otzi the Iceman. Thomas Nunuk and a friend were hiking in the High Tatras Mountains of Slovakia when they discovered an amazing sight, a frozen lake so clear it looks like they were walking on water. The two filmed themselves walking on the ice, showing just how clear it was. This is a very rare event that can only happen when specific conditions are met just right. When temperatures fall from mild to cold very quickly, combined with no snowfall, the water can freeze purely without any contamination. In 2012, hikers in the remote Kamchatka Peninsula in Russia made an amazing discovery of what appeared to be fossilized gears. Upon returning from their trip, they called local archaeologist and gave them the coordinates to the site for further investigation. After arriving on the scene they were blown away by what they saw. It looked like machine parts fossilized in 400 million-year-old rock. After analysis it seems these were indeed metal parts that formed some kind of moving and working mechanism. Nobody could believe that this could have been there that long, because there was no proof of intelligent life on the planet yet. They are convinced it came from another planet or other worldly visitors. Reading stories like these should inspire you to get out there and try to find something incredible yourself. Who knows, the next day hike you have planned might just turn into an amazing discovery.